About a year ago Code Climate announced its Velocity offering which provides engineering insights. Today they are taking the wraps off Version 2.0 for everyone. Existing customers have already had access to many of the new features. I am writing about this today because the whole history of the Velocity offering is illustrative of the right way to launch a new product even when you are a company that already has a mature offering (Code Climate Quality). Many organizations once they have a mature product fall into a trap. They can’t release something new because they can’t reset the dial to behaving like a startup. Instead of going out with an MVP and learning from customers they want to release something that matches the maturity of their other offerings. They often wind up not shipping at all or after a new startup has already come in and taken the field. Code Climate did a terrific job avoiding this trap. Their initial release of Velocity was intentionally minimal in the best sense of the word (think first iPhone). It was no frills but provided meaningful value and many customers adopted it. The subsequent feature development has been guided by the needs of these customers culminating in today's release. If you are looking to enable your engineering team and processes with better insights and analytics, go and check out all the goodness that is now part of Code Climate Velocity 2.0. Ten-thousand better decisions: Building a network around "network effects"
There are a million decisions that go into the process of building a company. By surfacing perspectives from 75 companies in our portfolio network, we hope to create tools that help people within each company answer even a fraction of these. Added up across this 10,000-person community, if everyone is enabled to make one better call, then this might lead to 10,000 better decisions than before. When starting a business, the founding team must decide early on what to create, who it's for, and how to build it. Following that, a new set of decisions emerges, including choices like how to launch, who to hire, and how much money to raise. And so, the process repeats itself. Albert Wenger, one of our partners at USV, likes to refer to this "leveling up" process like beating a new level in a video game. With each new level or phase of growth in a startup, you'll need to use the skills you've already mastered plus an added new challenge. By the time you're a 100-person, Series C company, the number of questions asked (and the sheer number of people deciding things) may have increased by a factor of 10. Admittedly, the role of an executive team also becomes infinitely more complex along the way. It's likely that there are people on the executive team who are going through the process of company-building for the first time, and making decisions might seem scary. Part of why it can be helpful to have a board of entrepreneurs, VCs, and advisors is because these people can offer insights, observations, and pattern recognition that you may never be able to see from your vantage point. And certainly, by taking board seats on many of the deals we see at USV, we strive to stick close to our entrepreneurs throughout each step of this process to do just that. How should we design behavioral interview questions for our candidate process? Should we migrate our system architecture to microservices? What PR firm should we work with to announce our Series C? Should the engineers sit next to the sales team, or on a different floor? Would a rebrand make it easier for us to launch internationally? Would this strategic partnership help us meet our OKRs this quarter? No matter where you sit inside of an organization, you likely have some decision-making power. Maybe you manage the office pantry and decide what type of food and snacks will give your colleagues the most energy to go about their days. Maybe you run IT and help prevent cyber-attacks or data breaches by educating your colleagues about safety best practices. Maybe you run your events marketing strategy and research the best conferences where you might set up a booth on the trade show floor to generate the highest quality leads for the sales team. The single weight of any one decision may be quite small, (See: "Should we have both breakfast and lunch snacks in our fridge?") but the outcome of each choice matters. Over time, each "good call" contributes to an additive effect of a stronger, better company. And this is how we've designed the peer-to-peer effects of learning across the USV portfolio network. We want to empower everyone to make the best decisions possible by surfacing as many different perspectives as we can. Rather than expect 1 person at the top to make the “right” call 100 times in a row, we've designed the USV Network around a second possibility: Can we help 100 people each make one slightly better decision than before? In aggregate, by encouraging cross-pollination of ideas and experiences through all of the talented people across our portfolio, we believe we can leverage our network to serve as a resource to help all employees learn and grow. In other words, when looking across our entire startup portfolio, we might ask: Can we help 10,000 people across 75 different companies to each make one better decision? Each year, there are more than 150 touchpoints for people across this network to come together and share "lessons learned" at various in-person and remote events. Outside experts join us from time to time to time, bringing outside perspectives about management, leadership, or other common questions that arise. 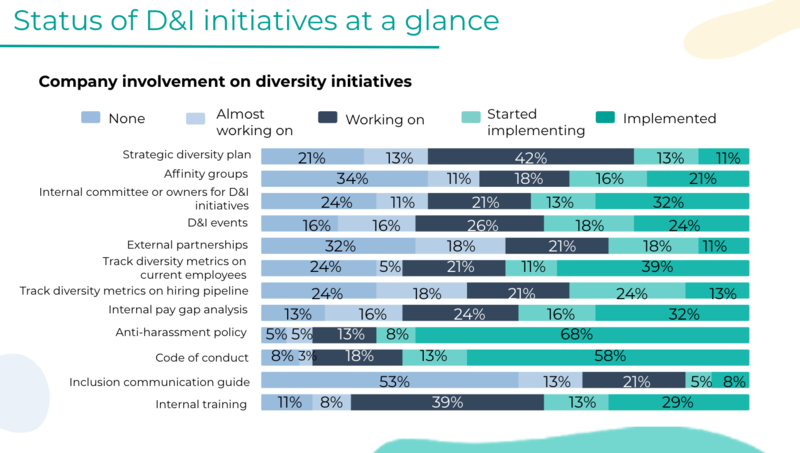 And dozens of people have stepped up to lead their own programming or even share back advice in one-on-one interactions with peers. In the end, we hope that by regularly convening people with similar functional roles across different companies, we might introduce new possibilities, solutions, and ideas -- one person at a time. So, can the USV Network help make 10,000 better decisions? It'll be impossible to know for sure. But we're certainly going to try. If the last decade has been a time of digital abundance--more followers, more “friends,” more apps--2019 looks to be the year of paring down. 2018 saw the first significant decline in time spent on site for Facebook. Users are deleting the app and replacing it with tools to track screen time. But our desire to find community and connection, and to leverage technology to do so in more effective and efficient ways, hasn’t changed. As a result, the coming years will likely be a time of renewed opportunity in new forms of social systems, the kind that has been difficult to come by during the major platforms’ ascension and dominance. This is not to say the incumbent platforms are going anywhere anytime soon. But there is likely to be a splintering significant enough to create new startup entrants with the chance to own consumer needs. Privacy and security. While events like Cambridge Analytica have drawn increased awareness to both the massive sets of data platforms like Facebook hold and the relative ease with which they can land in the wrong hands (let alone what the platforms can and likely will do with it themselves), privacy is still probably the lesser of the two core reasons for the degrading engagement. Increased privacy breaches that hit close to home for users will likely further point out that these platforms have created scale but not deep user trust--and emphasize the need to builded trusted brands to create true longevity. But, for now, its impact is probably lesser than that of reason #2. Users are no longer getting what they want (or as much of it.) The dominant platforms began with promises of curated communities, but have left us with crafted personas of what we want the entire world to see and a loose web of paper-thin connections. In the case of Facebook, this meant starting first with schools, then geographies, with real identities, initially verified with university addresses. But with an advertising-based model predicated on scale, success meant breadth so their purpose evolved to connecting everyone on the planet. They’ve accomplished this mission with billions of active users. However, the mandate of scale has made that initial premise of community on platforms harder to achieve. A decade plus in, this kind of broad connectivity is starting to seem more addictive but less fulfilling than many originally thought. Users are uber-in the know but feel emotionally disconnected. Lasting consumer businesses have to fulfill some set of human drivers and desires that, despite rapid innovation & technological change, basically remain the same--belonging, connection, curiosity. When they aren't being fulfilled, the products we use change, not the desires. The next wave of social systems will likely emphasize breadth and depth differently than the last--and may not look much like social networks at all. With the current networks, the horizontal nature of the platform is the product. Users come for the community. But it may be that with the next, the community is what keeps users long term engaged but is formed around another intent. Come for an action, stay for the community. Users share a common interest or objective (beyond connectivity.) Gaming is the vertical furthest ahead on these kind of new social systems and platforms like Twitch and Discord, in addition to certain games themselves like Fortnite, serve as great examples. Users come to watch a game, but stay to keep debating and discussing with a community of other gamers. Other verticals are earlier but show the same behavior. ShopShops* users sign on to watch livestreams of hosts shopping in retail stores and markets around the world, and to buy in real time. But, while they do, they wind up messaging with each other--responding to questions, sharing thoughts on the items, even splitting purchases (once a shopper only wanted one earring in a pair and another on the livestream happily took the other.) They come back as much to re-engage with the community as they do to find what they want to buy next. Users have skin in the game--they’ve in some way transacted or are on path to transact. This definition of transaction is broad--they purchase something, subscribe to something, or actionably engage with the brand before entering this group. This creates a deeper level of buy-in and, in effect, creates a “closed” community. There’s a lot of this behavior currently going on across platforms with the community building on Facebook and the transacting happening elsewhere. Duolingo’s* users connect in Facebook groups organized by the specific language they are learning to get extra practice, ask for help around tricky language rules, and share jokes. Embark, which sells an at home DNA test for dogs, has thousands of customers aggregating on Facebook to post photos and guess the outcomes of pending results. Owners with similar breeds connect with excitement, sharing tips. Increasingly, this community piece will be built into the platforms themselves rather than existing externally. Users in the best communities go through a transition from the specific to the broad. While users may join the network with a particular question or straight from a purchase, the best ones will expand the scope of the applicable quickly once the common ground has been developed. Dia & Co’s* most passionate customers, for example, aggregate in a group where they share best finds from their wardrobes but also ask for career advice and even plan vacations with women they only know through a mutual love of Dia. Glossier has the Into the Gloss community where passionate beauty enthusiasts come--first to talk about their favorite products (Glossier and otherwise), but then to go back and forth on travel tips and best self care post pregnancy. Multimodal business models--the best of these new networks will, over time, develop multimodal models that both take into account aggregated audiences as well as the services and products uniting them. Connie Chan at a16z wrote a great post on what we can learn from China about what some of these might look like. For the best ones, a multifaceted model that aligns business and customer combined with a platform that promotes transparency and depth of interaction will create a new level of defensiblity and stickiness. If you are working on a business involving this new evolution of community, I’d love to learn more. Differentiated user experiences are a cornerstone of the defensible businesses that USV has invested in for over 10 years. In the most recent articulation of our thesis - 3.0 - we also stressed experiences and trusted brands that expand access to, for example, knowledge. Trusted services are those that have business models that better align the interests of businesses and their customers. What would such an experience and aligned business model look like in the world of online publishing, that to date feels like it has replicated the offline model in a way that is cumbersome and decreases consumer value through clunky and increasingly invasive experiences? One that was resolutely consumer first by being clean, fast, and safe. One that wouldn't require users to change how they access content in order to benefit from the experience. And one that did not use a paywall. Scroll is a consumer and publisher service that satisfies these criteria by providing frictionless access to content by removing all ads and ancillary content, making pages clean and fast. It is no surprise that a specific user experience was the focal entry point for this company - the founding team’s background includes Chartbeat, Foursquare, Spotify and Google (some of those companies we have previously founded and backed). USV is excited to be leading Scroll’s Series A financing, announced today, and joined by Samsung Next, Bertelsmann, Gannett, Axel Springer, The New York Times and Uncork Capital. Scroll is a vastly better way to read or watch, across multiple channels - an open platform that puts consumers in control by offering bundled access (for $4.99 a month) to ad-free and mobile-friendly experiences on content sites around the world. When you visit a Scroll partner, that site automatically delivers an experience with no interruptive ads, pre-rolls, or links to baldness cures at the bottom of articles. Users control their own data through an API, and they can decide what they want to do with it - from requesting their data be anonymized to sharing their history with other services. Using mobile apps like Twitter, Reddit, LinkedIn or Facebook or just reading in Chrome, Scroll seamlessly syncs content across devices and is format-agnostic. One can start reading an article on a laptop, continue on a phone on the subway, and then finish as an audio story in a car. Dozens of publishers are currently part of the network, including Buzzfeed, Vox Media, MSNBC, Business Insider, The Atlantic, Slate, Fusion Media Group, The Daily Beast and more. We believe this model empowers, not disintermediates, publishers by giving them an important choice in addition to their ad-supported business. As important, publishers using Scroll will make more money than using an ad-only model. Now, more than ever, we need an Internet that feels built for us and a free press able to thrive. Scroll firmly believes in this vision, and USV does too. Today we’re excited to announce the launch of our new USV Talent Network. Our USV Network is a startup community of more than 9,000 employees across 75 companies all over the world. Each company leverages network effects to build stronger businesses and broaden access in differentiated ways. We operate our portfolio network in a similar way and support every employee in finding access to the people, information, and resources they need to do their jobs better. Because this collective knowledge base increases as our portfolio grows in size, working for a USV company broadens your network each time we make a new investment. This initiative is the first time we are deliberately seeking to expand the reach of our USV community beyond our current portfolio. We hope to extend our collective footprint even further -- to seek out candidates our companies may want to hire, to identify best-in-class leaders who would like to be a part of our community, and to invite alumni (people who used to work at USV network companies) back into the fold. Built in partnership with Monday.vc, once you’re accepted to this network, you can request introductions to companies across the USV Network when you see jobs that interest you. Even if there aren’t any current job openings that fit your criteria, you’ll be able to signal your preferences and receive notifications when new roles open up in the future. If you are interested in working for one of our portfolio companies (either now or sometime in the future), we invite you to apply to join our extended talent community. Over time, we’ll surface interesting jobs to you and invite you to engage with our current portfolio by sharing your expertise or joining us at events. Part of the benefit of being in the USV Talent Network is the ability to connect with the companies directly instead of having to compete with every other person applying to a job. Throughout the year, the USV Network facilitates more than 150 events (both in-person and digital) to bring together peers in similar domains at different companies and encourage cross-company learning opportunities. It can be scary to join an early-stage startup. There’s a lot of inherent risk through the discovery process of identifying product-market fit and dozens of complications along the road to scaling a business. If you’re the joining a company sub-50 employees, it’s likely that you’re the only one at that organization in your functional domain area. That feeling can be pretty lonely. When you get a job in the USV Network, you’re not just joining a company; you’re joining a community. If you’d like to be a part of this community now or sometime in the future, we invite you to join us today and apply here. Recent conversations around healthcare have surfaced words like “crisis” and “collapse”. Besides being confused by the existing system, 20% of Americans can no longer afford basic healthcare (including their insurance premiums), leading to a higher number of people who are uninsured or underinsured. Now, unbundling is enabling a wave of new business models as the healthcare system shifts towards more virtual, independent, local points of care (an idea introduced to us by Dave Chase in his book, “The Opioid Crisis Wakeup Call”). These new approaches generally fall into one of two buckets: change of infrastructure (who pays, when they pay, how they pay) and change of venue (from in person to online). The emerging business models tend to be much simpler and instead of operating in bundled networks, there is an increase in independent clinics and care delivered through mobile phones. Four novel models of care are emerging: direct to consumer, direct to employer, value-based, and group cost-sharing for catastrophic events. Recently, we’ve been looking at this first category, however, they could all broaden access with the advent of unbundled health services. Direct primary care practices are opening up independently of a hospital network or insurance company. In this model, each physician operates as a separate entity and can decide how to charge their patients. Many, such as Unorthodoc and Gold Direct Care, seem to be using a subscription model and some practices use different tiers of pricing depending on the level of care that a person needs (usually around $30 to $120 per month). Another example, SparkMD, offers custom packages including family rates, house visits, and telemedicine. While well-loved concierge practice One Medical prices their membership package at a premium (~$150 per year on top of the cost of care), DPC clinics generally hustle, trying to provide affordable options wherever possible. They broaden access. The subscription model for primary care (Healthcare as a Service, or HaaS), whether in person or virtually, aligns incentives more naturally between the patient and provider. If each primary care physician - which many view as the center of healthcare - operates an independent practice and is able to communicate with local specialists to find the best price for their patients, then smaller microeconomics could start to form in each city or town that allows patients to make decisions with full price transparency. In today's more centralized model, physicians that are part of larger network tend to refer patients to facilities in-house even if they are more expensive. Instead of decentralizing healthcare to local neighborhoods, the system can be broken down to a different unit: employers. Today, employer-based healthcare tends to prioritize convenience over affordability. However, with more unbundled services and specialists, what if every employer had its own system for patient care and external referrals? Euphora, Paladina, and Apostrophe are examples of companies enabling this model. In the case of the latter, in particular, by replacing third party administrators for self-insured employers and saving employers money in the process. Elation proposes that employees are more likely to seek out preventative healthcare - and thereby lower downstream costs - through an on-site clinic. Employers are one of the most incentivized players to keep healthcare costs low and employees healthy. If primary care operated in-house, employers would manage the workflow and payments through a platform like Eden, for example. More interestingly, this can be extended beyond unbundled primary care. Sano Surgery offers self-insured employers access to medical professionals in 13 specialty verticals and even allows them to pre-purchase medical services, which fundamentally changes payment dynamics. Employer-based healthcare doesn’t necessarily solve the ‘access to healthcare’ problem because employer-based insurance covers only 56% of the US population today. This begs the question, should companies (or even, can companies), in addition to their mission, be focused on healthcare as well? In value-based care, payment is based on health outcomes for entire episodes of care rather than solely on initial treatment plans. This is straightforward for commoditized parts of healthcare, such as a routine surgery, where a la carte pricing works. A great example of a simple business model is the Surgery Center of Oklahoma, where patients know prices and pay up front for each “episode”. The SCO website lists medical surgeries as food would be listed on a menu. As patients continue to visit from in and out of state, their goal is that more centers and practices will adopt this practice, making the back-and-forth with insurance companies obsolete. Thinking about long-term illnesses - for example, diabetes management, cancer, or asthma - becomes more complicated. For an independent specialty clinic like Pure Cardiology, value-based care might require making a plan and having the patient pay when specific milestones are reached. While this solution could result in delayed payments for doctors, they can ensure that incentives are aligned for both short-term and long-term episodes of care. Medical cost-sharing groups, where people pay to support others in their community, are appearing more often. Medishare, Sedera and Liberty HealthShare are examples of cost-sharing within local communities, neighbors if you will, that combine a non-medical community - either geographic or religious - with their medical insurance for both routine health issues and catastrophic events. In some instances, these groups may appear closer to non-profits than large insurance companies: Liberty HealthShare’s decision guide emphasizes that they are not “insurance”, and are incentivized to work towards decreasing the healthcare burden on the whole group. Still, for-profit innovation is occurring on the insurance side. Many companies are working towards a future with at-home testing, processing prescriptions with one tap on your phone, and virtual appointments (including USV portfolio companies Modern Fertility and Nurx). More fundamentally, there could be a subscription option for primary care for those that only interact with their doctors by mobile phone unless otherwise necessary. Companies like Sherpaa and Nurx are changing the venues of care to text-based conversations, at-home testing, and remote monitoring. Asynchronous, structured data collection thrives in a decentralized model of healthcare because it is cheaper and time efficient, allowing each doctor to help more patients and decrease the points of friction in getting care. A pure VPC model eliminates fixed costs associated with brick and mortar expansion and is able to focus resources on reaching more patients, recruiting more doctors to their platform, and improving the experience for current patients. Payments on a subscription basis allow doctors to get paid more consistently rather than waiting for insurance companies to process claims and paying overhead costs to negotiate reimbursements with their billing offices. Mobile, pop-up clinics in different healthcare verticals (from urgent care to specialized medicine) are also growing. An open question regarding broadening access is whether this model is scalable to all parts of the country, or whether it perhaps favors population dense cities. Two examples in women’s health are Kind Body and AskTia. Women can go for a regular checkup or with specific questions related to fertility, IUDs, etc, and receive a highly specialized experience. This can feel much simpler from the patient perspective, as these models often rely on subscription payments or disclosed, fixed pricing for each service. Another example, specific to cardiology, is Heartbeat, where people get direct access to a fully-digitized boutique cardiology clinic. Here, the venue of care is shifted here from hospitals to pop-up clinics, that are smaller and easier to scale. Health-related issues are confusing as is, so the system around it should be as simple as possible. New business models are lowering the barriers to entry for users to get access to high-quality care. Cost is driven down through technology and healthcare is made simpler through new unbundled business models, streamlined payments, and better user experiences. As companies continue innovating in this space, both in terms of business model and venue, the future of healthcare is starting to become clearer. We’re excited for that future. USV has been investing in health-related technologies for about five years. Our approach can be characterized by the notion that digital processes, made more accessible by the internet and mobile access, could over time transform the cost and delivery of medical care. In the last couple of months, our conversations around healthcare have surfaced some new investable themes, which I’ll discuss in a few posts over the next month. The first such theme is the idea that healthcare can be “unbundled” into distinct services, a pattern we have seen in other markets (where niche sub-markets develop for specific services). So, in the case of healthcare, what is there to unbundle from? For one, large hospital networks and insurance companies, where most of the control and pricing power currently reside. The last decade has seen unbundling in the financial services industry that serves as a relevant analogy. Financial supermarkets became popular in the 80s when large banks started offering one-stop shopping for a complete package of financial services, anything from mortgages to credit cards. In this model, the sale becomes around convenience rather than value as customers buy a complete package, even though each service may not be the best in breed or meet the specific needs of an individual consumer. With this, came a lack of price transparency as each service’s individual price is obscured by the combined package. The connected Internet and later mobile services, have made it easier to manage an unbundled package as well as increase the quality and personalization of each service on its own. In finance, we’ve observed that in the broader market, as well as within our own portfolio of fintech investments, with Funding Circle (peer-to-peer lending platform for small business), Stash (personal investing), CircleUp (equity financing for consumer products), Stripe (payments), and KickStarter (crowd-funding). Technology made processes simpler so that individuals could find specific things they need easily and affordably from market-specific providers. Perhaps healthcare is now seeing the beginning of unbundling, catalyzed by the same use of technology which allows companies to focus solely on user experience in specific verticals. Some of the first pieces of unbundled healthcare to get venture momentum were direct-to-consumer brands such as Hims, Roman, Keeps, and Nurx. These are examples of companies using technology - such as telemedicine, asynchronous chats, and structured data - to lower costs and reduce friction in various niches of healthcare via a simple subscription business model. For example, Nurx gives users control of their health at every step of the process and delivers birth control and Truvada for PrEP in a timely, cost-efficient manner. Along a similar vein, at-home testing companies such as 23andMe, Modern Fertility, and Scanwell are bringing lab-grade testing services to people’s homes at a lower price point by leveraging technology. For primary care, companies like Sherpaa are using virtual primary care, while Doctor on Demand and Teladoc started by unbundling to serve individuals through telemedicine. Now other companies such as Vera Whole Health, CareMore, and PeakMD are coming up to serve employers with their primary care needs through local care centers. Then there are examples of unbundling in parts of primary and specialized medicine that have not received as much attention yet, perhaps because their interactions are primarily conducted offline. However, these companies are still a part of the trend towards unbundling from large hospital networks and functioning as individual nodes in the broad healthcare market. For example, Pure Cardiology is a user-centric membership plan for all cardiology-related services, the Surgery Center of Oklahoma offers a menu-style list of surgeries they perform with up-front pricing, and the East River Medical Imaging Center in New York is an independently owned and operated center for scans including MRI, CT, PET, and X-rays. In primary care, there has been a recent increase in the number of direct care clinics around the US, or doctors that are offering traditional primary care through an independent clinic without ties to large hospital networks and insurance companies. To support these practices, companies like Hint Health (onboarding and billing platform), Spruce (patient communication), and Elation (clinical electronic health records) are building the infrastructure to power a direct-care driven healthcare system. Technology enables new user experiences for quick onboarding and communication, but other offline examples of lowering friction are walk-in urgent care centers, such as CityMD and GoHealth. These clinics provide immediate medical care for a range of acute conditions that provide underserved patients with faster response times. Walk-in urgent care clinics started popping up in the 70s but gained more traction in the 90s and now service over 160 million visits annually. These examples suggest that healthcare is in some respects being unbundled. Why does this matter? One lever to getting momentum in an unbundled world is that a lower price point - a common denominator across many of these companies - compared to traditional bundled options, will allow more people to access healthcare. Besides just lowering costs, unbundling can open access in other ways, including minimizing the enormous friction that exists in legacy healthcare systems. If healthcare services continue the trend of “unbundling” in some of these ways, cost-efficiency will become much more of a priority where the fastest, cheapest, and most reliable services should win. More fundamentally, unbundling could create the opportunity for each of these distinct services to become independent nodes in a larger network in a bottoms up manner (which would make room for business model innovation - the subject of my next blog post). For now, these observations seem to indicate some unbundling of the existing large, monolithic systems in healthcare towards a more open, local, independent and transparent model, with control residing with individual users. And ultimately, this could change the way healthcare is delivered to consumers. It's been a busy summer of reading for us here at USV. Since we often receive requests about what books people are reading, we polled the USV team internally to find out what picks and recommendations they each wanted to share with all of you. "Still reading it, but enjoying it so far"
This summer at Union Square Ventures, Jennifer Greenberg joined us as our summer intern. During her time at USV, she worked on many projects, and one of them was analyzing tools from across our portfolio companies. As part of this process involved grouping and sorting tools, she came away with a few observations from her project. Read her post below. Hi, I’m Jennifer Greenberg, a current computer science student who had the pleasure of interning at USV this summer to support the Network Team. Through my community management work in Slack as well as in attending USV network events, I noticed that one of the most common questions that comes up in the network is what tools are used by other companies. To embark on this research project, we gathered over 450 software tools used across 64 companies, representing approximately 86% of our active portfolio. We began by tagging each tool based on department, the type of tool, and then explored how company size impacted usage. Below are some observations and trends that we discovered. The top reported tools were G Suite, Slack, GitHub, Jira, Sketch, Salesforce, DropBox, AWS, Excel, and InVision. These top tools (in particular G Suite, Slack, and GitHub) were used across multiple departments or tended to skew toward developer tools. The chart below show the most popular developer tools overall in the network. After Github and Jira, there was a drop off which may be because there are many free/open source options, causing individuals and companies to explore and favor different ones. 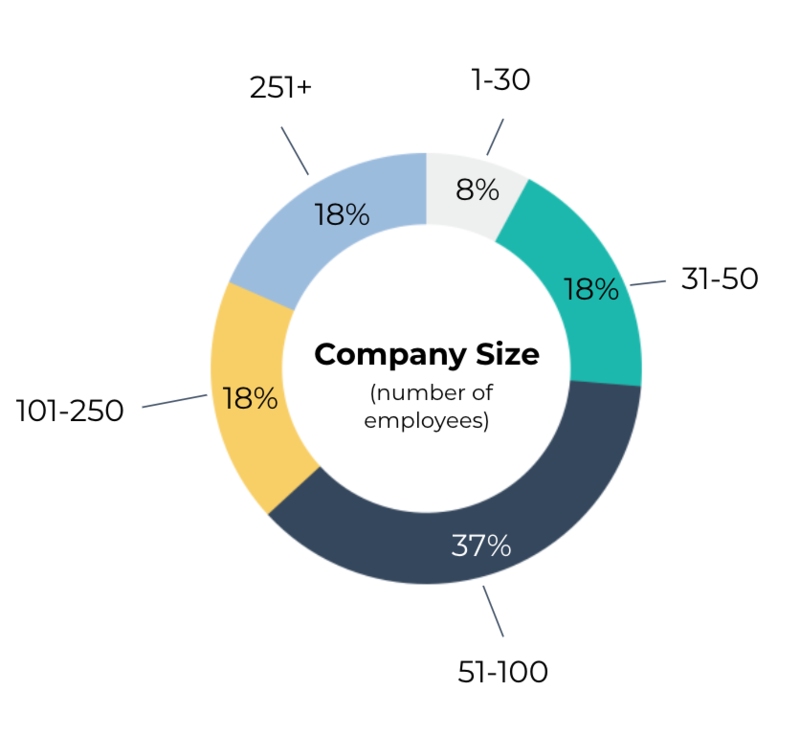 Company size creates a stratification among developer, hiring, and communication tools. As an example of how this plays out in engineering, you can see that all of the size brackets use either Github or Jira, but after that, the differentiation develops. For example, smaller companies are less likely to use security software. On the communication side, smaller companies are more likely to use internal tools like Calendly, GoToMeeting, and Rocketchat, whereas external tools including Docusign, Facebook, Medium, Sendgrid, and Twitter persisted across all size brackets. As for hiring tools, LinkedIn, Lever, and Greenhouse are the most popular in the network, but these are primarily only used by companies with more than 30 employees. Tools like Guru, Textio, DiscoverOrg, and Checkr were used with companies larger than 50 employees, while Jobbatical, Entelo, Jazz, and AngelList were used by our smaller companies. While AWS still appears to be the favored cloud platform used among our portfolio, Google Cloud in particular appears to be gaining more traction. As you can see below, ¼ of companies are using either Google Cloud or Microsoft Azure. Other tools with dominant market share include Slack and Salesforce. While 92% of our companies report using Slack, some companies opted to use Hipchat (recently acquired by Slack), Beekeeper, and Rocket Chat. For sales management CRMs, 42% of our companies use Salesforce, however, some used alternatives like Google Streak, Insightly, or Close.io. It does not seem as though size played a role in a company's choice in any of these circumstances. While the average company in our portfolio is using 7 tools, one of our larger companies reported using 77 different tools, which made me realize that transitioning between tools may be a source of growing pains for startups. As our portfolio continues to expand, we hope that by aggregating and sharing this list internally (we’re even building a Slack Bot for our network to search these tools), we can make it easier to choose the best tool for each use case. Hey all, I've recently joined USV as the firm's very first Developer in Residence. Over the next year I'll be porting USV's thinking around networks into code, and writing the APIs, apps, and bots that will help folks at our 70+ portfolio companies communicate and collaborate with each other. Having an in-house developer is still a bit rare in venture capital, but it feels like a natural fit for USV. Building on its early success investing in businesses that leverage network effects, USV brought this approach to its own network in 2010, launching an effort to facilitate interaction among network members through events and introductions. And now my job is to grow this platform online, to help reach and connect a greater share of folks in our increasingly diverse portfolio. Helping like-minded folks discover and learn from each other was one of my favorite things in building BrooklynJS, my favorite community here in the city. To be able to do the same for USV is a great gig, and really, second only to my other gig, moonlighting as a bass for Brooklyn's favorite-slash-only barbershop quartet. If you’re building a similar platform and/or have ideas about what kinds of interaction mechanics work well for community building, please drop me a line! Universal Basic Income (UBI) is the idea that citizens receive a regular, unconditional stipend that helps them cover their cost of living. Previous UBI experiments have shown to reduce hospitalization, crime and poverty rates. Richard Nixon, Thomas Paine, Martin Luther King Jr. and Milton Friedman were all vocal proponents of UBI. UBI has traditionally been imagined as a government subsidy that would put money back into the economy by giving it directly to people (as opposed to quantitative easing where the Federal Reserve puts money back into the economy through banks). The development of cryptocurrency, however, now gives us a way to implement UBI in a global, trustless and democratic way without the need for a government to implement it. and Solidar (implemented as a chatbot on FB messenger). We are intrigued by this possibility and are wondering about some key issues, such as the complexities around issuing new currencies and preventing fraudulent accounts. When blockchain projects implement UBI, where does the initial money come from? The majority of the UBI blockchain projects issue their own currency in the form of tokens. That is, instead of recirculating existing money in the economy, they generate new value by minting a new currency. The challenge is that while the idea behind UBI is to provide real income that can be used for paying for things like rent, tuition and groceries, newly invented currencies are initially worthless until someone accepts them. It is up to each UBI project to make their currency worth something. Projects do this by building an economy around the currency where people can exchange and use their tokens to buy goods and services. Nick calls this building a ‘Minimum Viable Economy’. The idea behind a Minimum Viable Economy is to build enough of an ecosystem around a token so that its holders can use it to buy goods and services or exchange it to other currencies. For this to happen, the project needs to incentivize merchants and vendors to accept the token as a form of payment. projectUBU (beta) is building tools for vendors to be able to easily add support for their UBU token. Enumivo (pre-beta) is building their own blockchain (a fork of EOS) with the goal of developers building dapps that accept their token, $UBI. It is easier to convince vendors to accept a token if there are a lot of people that hold the token. A good analogy for this is the credit card: even though vendors dislike credit cards because they are expensive and require extra in-store hardware, they are incentivized to accept them because so many people have them. To seed this network effect, many UBI projects have referral programs to reward people who bring in new users. projectUBU, for example, rewards 1,000 UBUs to the referrer and 500 UBUs to the referee per referral. Some projects, instead of doing a one-time bonus, continue to award the referral bonus as long as the referred person stays in the network. Frink (beta), for example, plans to indefinitely payout an additional 10% to referrers, and Mannabase plans to payout an additional 100% to referrers for one year. The idea is to incentivize people to refer “high quality users” that will stay in the network for a long time. An interesting question is whether a high referral bonus will increase the incentive and potential for referral fraud. These referral programs are often set to expire when the network grows to a desired size. Solidar’s program, for example, is scheduled to reduce the bonus by 50% when the network reaches 15,000 users and then again every time the network size doubles. Projects also need to incentivize people to spend their tokens. UBI projects can build in monetary policy that makes it more attractive for token holders to spend the tokens than to hold them. There are two ways to do this: demurrage (some amount of held currency automatically dissipates) and by growing the money supply (so that each held token is now worth less). Both accomplish the same goal of incentivizing token holders to spend their currency, otherwise their held currency will lose some of its value. projectUBU is one of the projects utilizing demurrage: 1% of all UBU wallet balances dissipate every year. Circles is one of the projects planning to mint more currency: they plan to grow their money supply at a 5% annual rate. The most dramatic of these programs is Solidar, which has an annual 20% demurrage rate. Another way projects incentivize people to spend their tokens is by capping the amount of tokens any account can hold at one time. In order to receive more tokens, participants need to withdraw or spend the tokens they’ve already received. SwiftDemand, for example, only allows accounts to hold 7 days of unclaimed income at a time. Another way to create value in tokens is to provide liquidity - aka the ability for a token holder to exchange the token for another currency, usually fiat, like USD. For there to be liquidity, there needs to be someone who wants to buy tokens from those that hold it. One project called Big Foundation (beta) is seeding liquidity by paying people a bonus for buying the token. Another interesting approach here is Democracy Earth’s distribution program. Because their currency has immediate utility as a vote, there are more likely to be buyers of it. Democracy Earth (beta) is a governance platform, and buying currency can mean buying power. The caveat is that organizations built on Democracy Earth can set their constitutional smart contracts to limit only one vote per person per issue, which inhibits the ability for participants to effectively buy votes. Before a UBI project can hand out tokens, they first need to verify that each participant is a real person, and that each person is limited to a single account. This prevents cheating via ‘Sybil attack’ where a user creates multiple identities that all trust and validate each other in a closed system. If every user could create multiple accounts to increase the amount of income they received, it would dissolve the public trust in the value of the currency, and depreciate its worth. It would also undermine the spirit of the project where in everyone gets the same amount. There are two main ways that UBI projects are solving this: voting and social trust. The first way is allowing members of the community to vote to verify a new participant. On Democracy Earth, for example, new participants have to go through a validation process with other previously validated community members in order to be able to join the network. (They actually plan to have every participant repeat this process periodically in order to prevent abandoned accounts). The second way is by relying on trust relationships from the real world. Circles (pre-beta) does this in an interesting way: On Circles, each new participant is issued UBI payouts in their own personal currency. That currency is not worth anything because no one agrees to exchange it yet. To make their account balance worth something, Circles participants need to trust each others currencies by being willing to exchange them. From the Circles documentation: "The value of a specific personal currency is a measure of how many other accounts trust it. This means that users who are new to the system and don’t have many trusted relationships have a less valuable currency than someone who is well-established in the network. It also means that the currency of new users gets more valuable over time as they create more trust relationships." Enumivo plans to do a combination of the social graph and voting solutions. People who want to join Enumivo will have to find someone already in the community to sponsor them. To sponsor someone, a community member stakes 200 tokens (10 weeks worth) and then other community members have 30 days to vote on them. There are also standalone identity projects like uPort and Civic that future UBI projects could potentially leverage. Generally we are very interested in learning more about self-sovereign identity projects that could enable decentralized programs like UBI. There are two ways most UBI projects fund their development: by holding a percentage of their tokens (most UBI projects do this), and by collecting transaction fees (some UBI projects do this). What I like about these revenue sources is that they align the core team’s interest with their users’ interests. The better the core team grows the network and token economy, the more their tokens are worth, and the more transactions there will be to collect fees on. One of the applications of blockchain that we are very excited about is UBI, and we hope to keep learning about how different projects are implementing it. If you’re working on something in this space, we’d love to hear from you. Reach out, I’m [email protected]. I know my favorite day of the year should be our USV CEO Summit. But it’s not. It’s actually USV Intern Day. On this day, which we now host once a year in both NYC and SF, we bring together interns from dozens of portfolio companies and invite them to learn about all of the companies in our portfolio. For me and Lauren, this day feels a little bit like summer camp -- we sport swag from our portfolio companies and shuttle interns around the city all day. We jumped on it immediately and rallied participation from more than a dozen NYC companies. 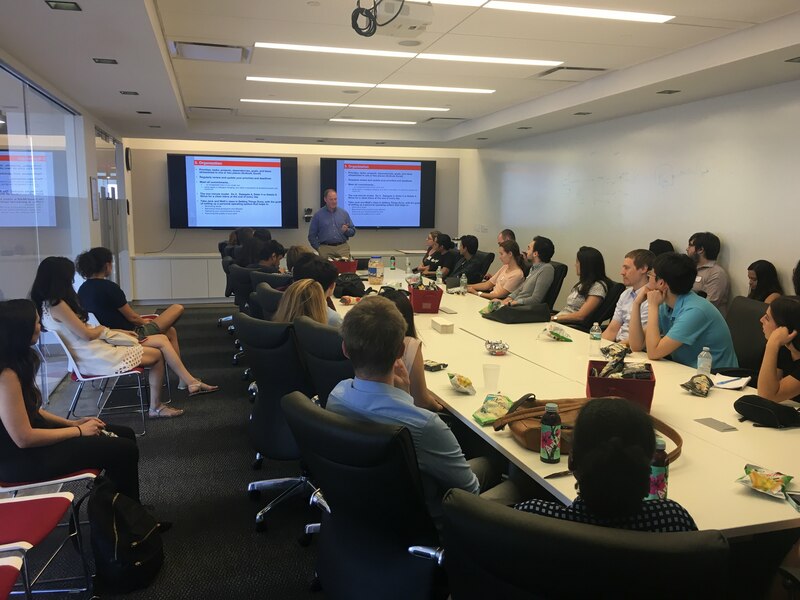 For participating interns, we organized a multi-stop event with two tracks (technical and business) featuring short talks, office tours, and job advice from the incredible leaders in the network. Some companies handed out free swag to all attendees. Meetup concluded the day with a pizza party on their incredible roof deck. But I don’t like Intern Day because of the pizza and the swag. I like it because of the deep collaboration and sense of community that it represents among our portfolio. 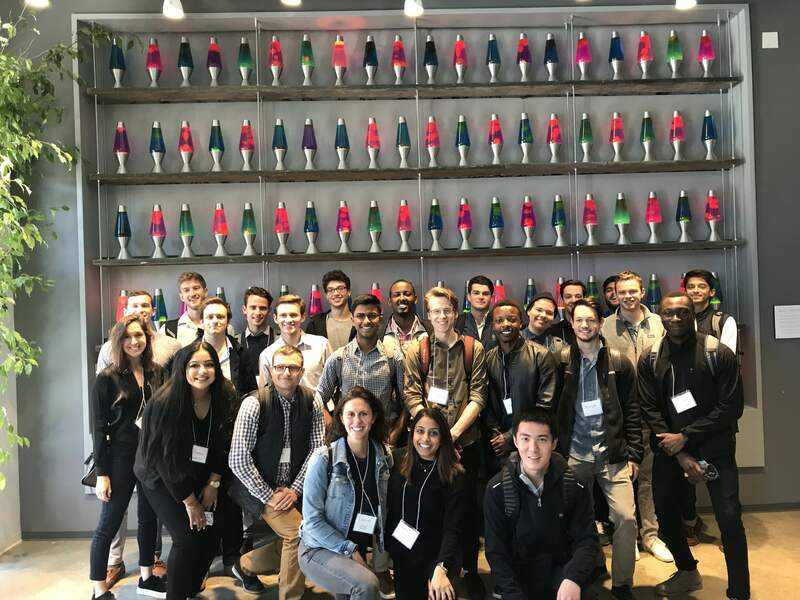 This year, we had about 75 interns between our San Francisco Bay Area companies and our NYC companies. Product and operations leaders from Skillshare and Code Climate each took an hour to introduce these students to the complexities of their business models and careers in tech. Shippo in San Francisco facilitated an entire panel discussion with robust Q&A. Clarifai taught a group of 40 students how they think about AI and machine learning. Matt Blumberg, CEO of Return Path, spent the last hour of his busy workday sharing candid advice he wished someone had taught him before entering the workforce. When kicking off the day, we shared two stories with the intern class this year. The first was the story of how Andrew Sutherland, at age 15, started a flashcard app for himself while studying for a high school French test that eventually became the company and brand we all know today at Quizlet. The second is how, in their first first job after school, Meetup CEO Scott Heiferman met his now-co-founder Brendan McGovern when they sat next to each other on the very first orientation day at Sony. One of the things we are so privileged to see at USV are the origin stories of entrepreneurs all over the world. We hope that, even by bringing together interns for one day out of the year during their summer, we’ll spark some inspiration or ideas that will come back our way several years down the road. At USV, we have been active in the blockchain/crypto sector since 2011. At this time, we have direct investments in nine companies/projects in the crypto space and one exited investment. Companies in the blockchain/crypto sector make up about 15% of our active portfolio and closer to 25% of our recent investments. But the venture capital fund model is not optimized for investing in the blockchain/crypto sector. Blockchain/crypto companies/projects often finance and monetize via tokens which can become liquid quickly and thus we can end up holding highly liquid and volatile positions which is not something we have traditionally done. And because USV operates under the venture capital exemption to Dodd-Frank, we are limited to 20% of our holdings at cost in “non-qualifying” investments, which include tokens. So we have sought out other relationships in the sector that can allow us to get broad exposure to the most interesting companies and projects. Our most recent investment, which closed last week, is just that. USV became investors in Multicoin Capital, a fund that is focused exclusively on the blockchain/crypto/token sector. There are a lot of smart people thinking about and analyzing this emerging sector, but there aren’t many who are doing it so publicly and conversationally as the Multicoin team. Their blog posts are here and their tweets are here: (Kyle, Tushar) . Their opinions are often controversial and contrarian. You can make a lot of money by being right about something most people think is incorrect. So at USV, we appreciate and value original thinking. Multicoin often talks about “venture capital economics with public market liquidity.” The token sector offers both, and that is partially what has caused USV some challenges making this sector work in our current fund structure. Multicoin is structured in a way that gives them and their investors the benefit of both. We are excited to be investors in Multicoin. Multicoin joins a roster of other blockchain/crypto/token funds that USV has invested in over the last 18 months. That list includes Polychain Capital, Metastable Capital, Blocktower Capital, Arianna Simpson’s new fund Autonomous Partners, and Placeholder. Placeholder, like USV, uses a venture capital fund model for its investing. All of the other funds use more of a hedge fund model. This portfolio of token funds gives USV a much broader reach across the blockchain/crypto/token sector than we would be able to get directly on our own and we also benefit enormously from the dialog and information sharing that exists across this network of investors. USV has not become, and has no plans to become, a fund of funds. But the blockchain/crypto/token sector has some unique challenges for us and others in the venture capital business and we have taken a network approach to solving them, at least for now. We have and will continue to invest directly in both companies and projects and both equity and tokens in this space, often in a syndicate that includes one or more of these token funds. It is an exciting time to be investing in blockchain/crypto/tokens and we are fortunate to be able to do it along with some of the best investors in the sector.